The harbor in Procida, a small island in the Bay of Naples, a perfect romantic getaway spot. Marina Pascucci photos. 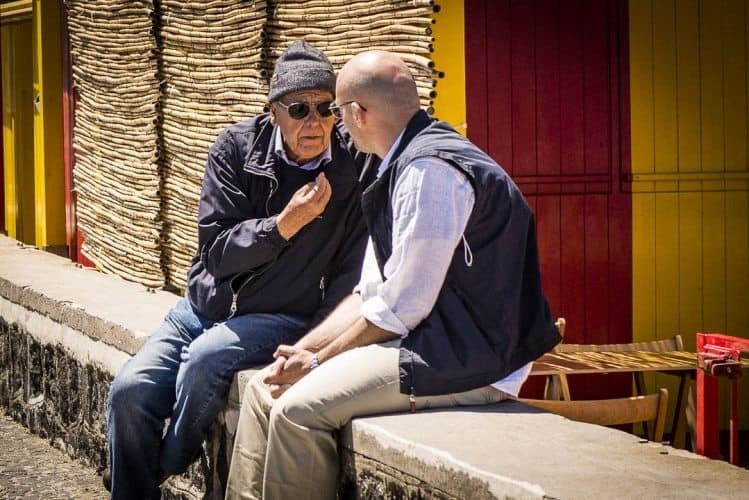 In “Il Postino,” the 1994 Oscar-nominated film about a postman falling in love on a small Italian island, Mario the mailman pesters famous Chilean poet Pablo Neruda about metaphors. It's a simple, laid-back life in Procida where locals still sit on stoops and chat all day. Mario wants the perfect analogy to express his love for a local woman he worships from afar. How appropriate the movie was filmed on Procida, an island that inspires metaphors from poets to postmen. And insurance agents. And cab drivers. And retired journalists who’ve lived in Italy 4 1/2 years and thought they’d seen every beautiful corner of the country. I was wrong. 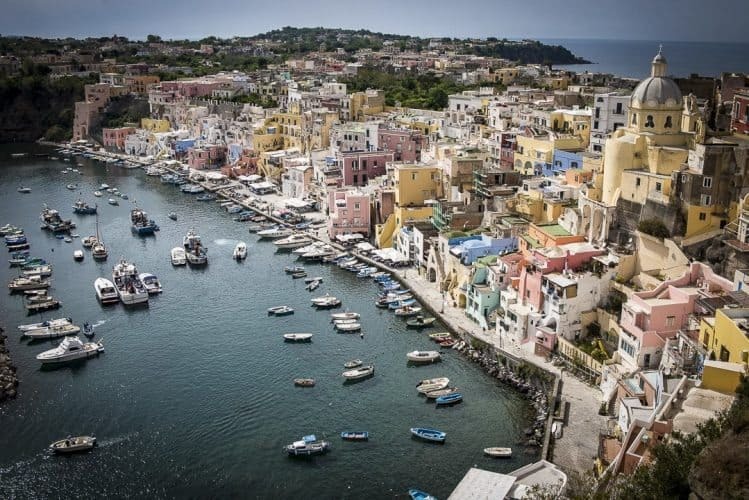 Procida is a jewel in the Bay of Naples. It’s heaven on a rock. It’s a summer’s day on a sea of storms. Better yet, after spending a recent weekend here, the best metaphor I could find is the simplest. The perfect lemony tiramisu at La Lampara restaurant in Procida. “Il Postino” takes place in 1950. Today, Procida (pronounced PRO-chee-duh) doesn’t look much different. The secluded marina still runs up to a pastel kaleidoscope of pink, yellow, turquoise and orange buildings. The roads in the villages remain too narrow for anything more than a couple of Vespas riding single file. The homes still have little patios over the bay with cast-iron railings and gardens in the backyard. It’s what you imagine of Italy in the days of innocence when wicker-covered Chianti bottles swung in windows and fishermen mended nets in the sun. It’s how you fell in love with Italy -- and everything around you. I took my girlfriend here to celebrate our two-year anniversary. It’s the perfect romantic getaway from where we live in Rome and should be under consideration for any visitor who tires of the crowds and heat of the capital. It’s a 70-minute train ride on Italo from Rome to Naples, then an hour ferry ride to Procida. Total cost for one: 29.40 euros (about $32). 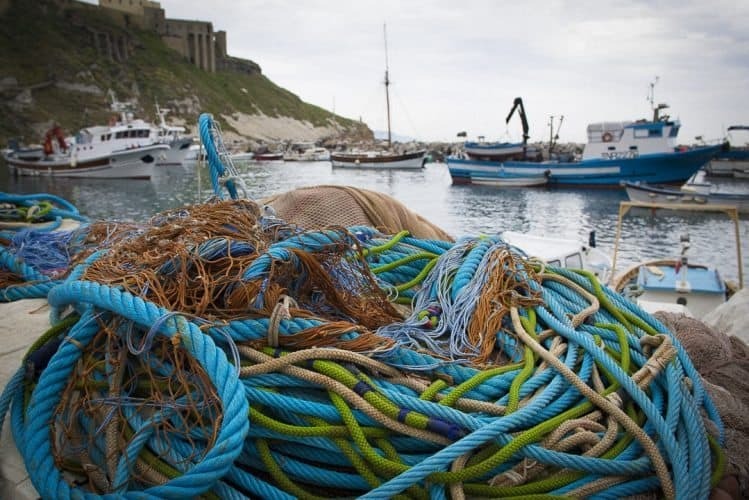 Fishing remains big in Procida. Our hotel was a 15-minute, slightly uphill walk from the port. It would’ve been worth an hour walk across broken glass. Albergo La Vigna sits high on a hill with rooms (99 euros for a double in May) leading out to a huge courtyard with cocktail tables overlooking the sea. Trails lead under grapevines (“vigna” means “vine” in Italian) past flowers of pink, orange and yellow all the way to a seaside overlook. Just off the lobby is a spa, complete with a Jacuzzi and Turkish bath, free for any couple to reserve for themselves. Like limoncello, Italy's famous lemon liqueur? 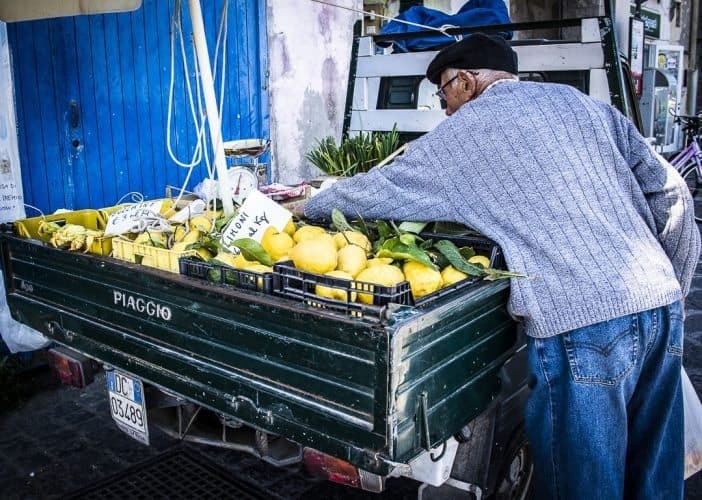 The best lemons in Italy are in Campania, the region that includes Naples and Procida. 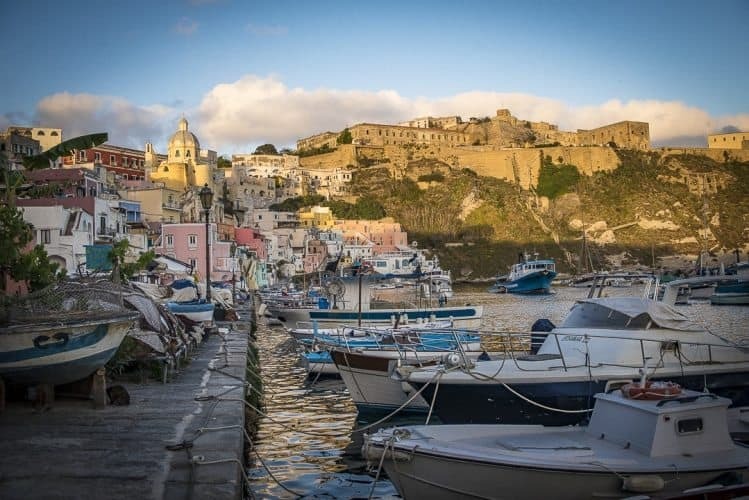 Procida is only about 15 miles north of Capri, an island so crowded with jet-setters, wannabes, and cruise passengers, you think you’re in an Italian theme park. Procida, all of 1.6 square miles and 12,000 people, even smells like Italy. We took a steep, stone staircase down about four levels from the quaint Piazza Martedi and its views of the sea to the marina below. As we descended, the smell of fresh fish and suppli, Italy’s famed fried rice and cheese balls, drifted up from the string of seaside restaurants facing Marina Corricella. That includes La Locanda del Postino. It’s the same yellow and pink building where Mario, the postman in “Il Postino,” sat and contemplated how to win over Beatrice Russo, the buxom brunette who doesn’t know he exists. With Marina, I didn’t bother with metaphors. I took her next door to Fuego, a brushed-up but dirt cheap pizzeria featuring pizzas for only 4-8 euros each. I had a lovely pizza of sausage, provolone cheese, cherry tomatoes, chili pepper and a sprinkling of cream next to a long table of 26 boisterous Brits. They have all worked at NATO for the last three years. Fuego's margherita pizza, the first pizza born in Naples, is named after Queen Margherita, who visited Naples in 1889 and it's been a traditional dish in the region ever since. 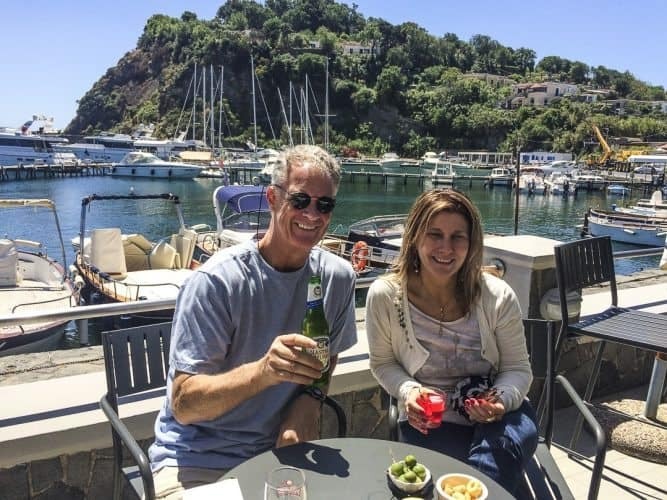 Procida is their company getaway. Food is massively important in Procida. Being part of the Campania region, Procida pizzerias feature the thicker crust you find in Naples, pizza’s birthplace. They also all come out of wood ovens that give the crust that slightly burnt, homemade taste. Seafood, however, is the big tuna here. Mussels. Calamari. Shrimp. They’re on nearly every menu with interesting twists throughout the island, such as at Crescenzo where I had the mezzo paccheri polpo and pecorino: thick halved macaroni with octopus and pecorino cheese. 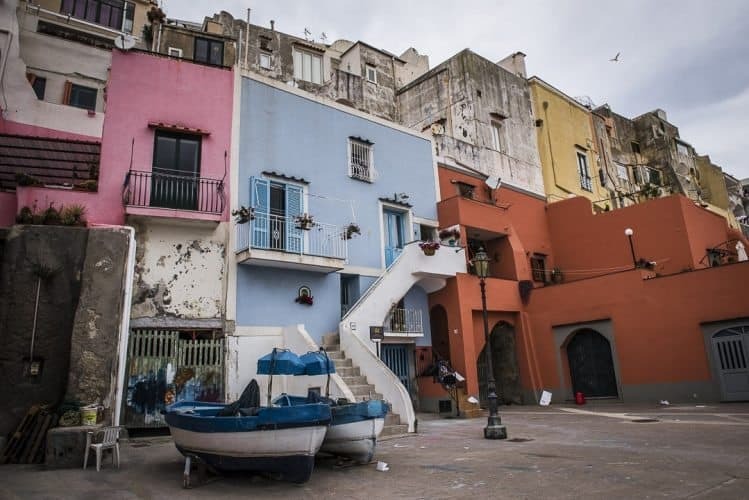 Procida's population of 12,000 is spread out among many pastel-colored buildings, like these along the Marina Corricella. We had our first dinner at La Lampara, so romantic it belongs on a Hallmark card. It’s on the limestone cliff connecting the marina to the piazza above. Every table on the covered patio has a gorgeous view of the gently curving marina. The marina lights danced off the water, bathing the boats in soft gold. La Lampara defies my theory that the better the view, the worse the food. My ravioli al sapore di mare (seafood ravioli) was ravioli stuffed with a ground mix of shrimp and ricotta cheese. It tasted like a tangy shrimp cocktail. It was simply the best ravioli I’ve had in a country that treats ravioli like works of art. 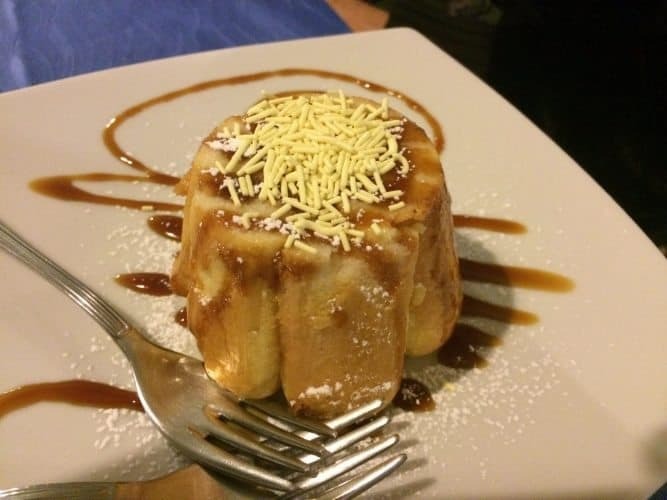 Chased with a tiramisu sprinkled with lemon and a half carafe of local Falanghina Benevento red wine, La Lampara moved into my top five favorite restaurants in Italy. After one day, I could see how Mario fell in love here. Procida drowns the senses with flavors and sights but also sounds. At one point in “Il Postino,” Mario records the sea lapping against the beach as part of a tape he makes of the sounds of Procida. I heard similar sounds the next day when we took a bus from the port to the long beach on the north end of the island. The bus took us through the heart of Procida few stop and experience. John and Marina at Chalet Vicidomini. Little villages with names like L’Olmo and San Antonio and Centane had the same pastel colors lining the streets. Flowers were everywhere: on corners, on balconies, in windows. It was like riding through a watercolor painting. We walked along the beach’s fine brown sand and I repelled Italian convention of walking into the dark blue sea in early May. Then I quickly walked out. It’s too cold to swim. Locals told me it’s swimmable from June through September. But the brilliant weather made it perfect for sitting on a beach towel and watching seagulls hunt for fish. Fishing nets and boat ropes for a fishing industry that has been around centuries. We walked along the boardwalk to the enclosed Marina Chiaiolella where we settled in at Chalet Vicidomini, a simple but romantic snack bar right on the marina. 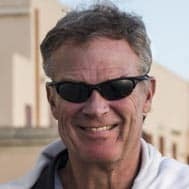 I had a cold beer and Maria had a bitter as we sat in the sun and stared out at the modest boats bobbing up and down in the water. This is the shoulder season, meaning the local joints are populated by Neapolitans, boat people and one couple from Rome: us. Locals say that Italy’s biggest recession since World War II hasn’t had an effect here. Advanced technology drove away its once-thriving shipbuilding industry in the 18th century and tourism has taken over what was once their biggest business: law enforcement. Hanging like a dead dragon nearly 300 feet up the cliff from Marina Corricella is an abandoned prison. Palazzo d’Avalos was built in 1500 for Cardinal Innico d’Avalos, but in 1830 it was converted into a prison and stayed active for more than 150 years. It finally closed in 1988 for the occasional guided tour but not before incarcerating tens of thousands of criminals and hundreds of guards. The prison never appeared in “Il Postino” but looking at the boarded up prison windows, at least the prisoners had good views. You can’t miss its omnipresence as you climb the steep road to get the great views of the marina. But like the rest of the island, the prison is now at peace. So is everyone when they come to Procida. After all, at the end of “Il Postino,” Mario gets the girl. Cape Town, South Africa: The Tip is Tops!